We are proud of the thousands of individuals who have volunteered and served on committees. The Board of Trade has been fortunate to have business leaders step up and take leadership roles in pur organization, to represent business at all levels of government. Pictured below are some of the Past Presidents. 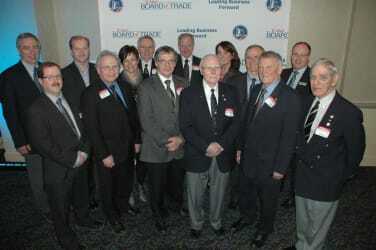 This photo was taken Feb. 2012 when the Past President's Recognition Program, which honours our past presidents, who helped build the organization, was launched. Each past president has been a significant player in the business community over the last few generations. With the help of Pat Thompson of Diamond Design, a long-term Board member, a gold pin was designed with a representation of the Cabot Tower and a single diamond. The pin symbolizes the weight of the position and the commitment made to the business community.